Add an additional seating space and a clean, sophisticated feel to your living room, bedroom or home office with this upholstered chair. Track arms, tapered block wood legs give it a contemporary, clean look. 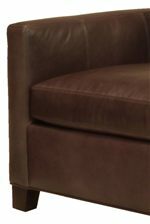 Its T-shaped back cushion and box seat cushion will make you feel at ease from the moment you sit down. The 1050 M Upholstered Chair with Track Arms by McCreary Modern at AHFA in the area. Product availability may vary. Contact us for the most current availability on this product. The 1050 M collection is a great option if you are looking for Contemporary furniture in the area.